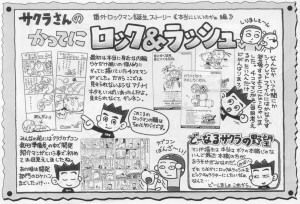 His unique rendition of Rockman and his friends portrayed them as troublesome kids who get into some strange (or sometimes ordinary) adventures. Rock in particular is rude, rash, reckless, rebellious, and completely without remorse, which only helped the shorts in attaining their notoriety in Japan. Set completely apart from the expected norms of what Rockman was all about, Rock and Rush and its unconventional author were satisfied just to be making a few laughs doing their own thing. What kind of thing, you ask? Let’s find out! Somehow, I always manage to slip these into the Secret Files without anybody noticing. It’s hard to come up with all these cartoons sometimes, but I always persevere! You know, the truth is that I first started making these as inside jokes just for myself and some close buds. That’s why there’s actually a lot strips with questionable material that I can’t show you! Yeah, too bad I can’t show ’em. Rock & Rush: Capcom Banza~i! Drawing manga isn’t actually my true profession, though lately I’ve been blowing off my real job to do it. (Rad.) Secretly, I want Rock and Rush to take off and become extremely popular… How about it guys. And become popular it did. Not extremely… but just enough. Rush: He-hey Rockman, are you sure Wily’s really hiding out in this scary forest…? Rush: WAAH! It’s a bear! It’s a bear! Rockman!! Rock: Here, everyone, hold on a minute. 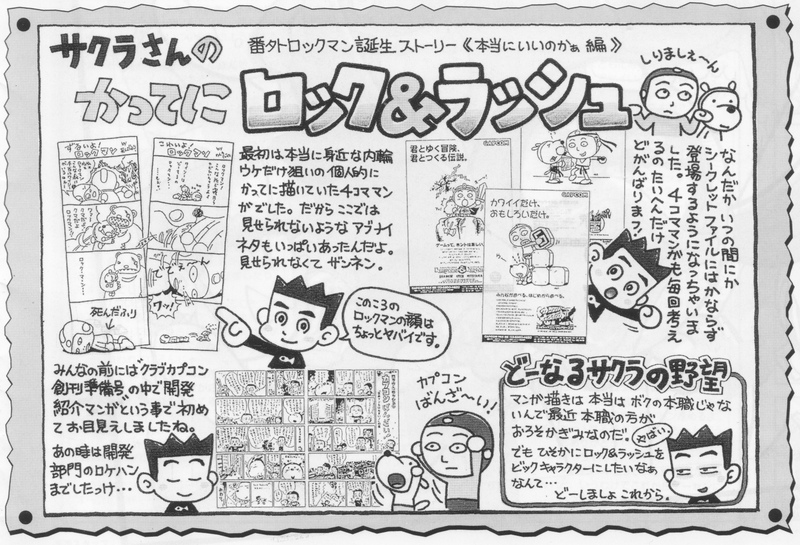 You can find some more of Sakura’s Rock & Rush at the bottom of pages 144 and 202 in the Mega Man Official Complete Works book. They’ll probably pop up again on the Lav, too. It’s just too strange not to! 3 Comments to "The Weird, Wild & Whimsical World of “Rock & Rush”"
Totally. I’m sure my first reaction to them was “…what IS this?” I figure people getting the PSN versions might be wondering the same thing soon.